Sega are planning to use half the proceeds from purchases of the winning entries in Polycount’s ‘War Paint’ skin competition to benefit the community. History buff? Try all the entries in our best World War II PC games list then. The competition, hosted by famed 3D artist gathering spot Polycount, challenged artists to create themed vehicle skins within four categories: Historical, Fine Things, Steel Beasts and Living Machines. You can see all the winners here, which include our favourite, the TigerShark seen above. 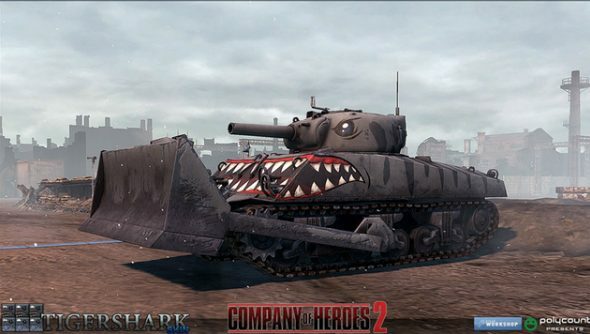 Having selected ten winners to go on sale during this weekend’s Free Weekend for the tank warfare game, Sega and Relic Entertainment are planning to use 50% of the profits to host tournaments and pay content creators. A minimum of 30% from each sale goes to content creators, while the first activity to see pennies from virtual sales will be an online tournament with a prize pool, organised in conjunction with the community.